Adding to the list of genealogy-specific search engines, in a press release today, WorldVitalRecords.com announced its new "international" search engines, each dedicated to a specific country, aimed at narrowing search results by excluding other countries. International genealogy search engines for 11 different countries are now available, including Australia, Austria, China, France, Germany, India, Kenya, Philippines, Tonga, Turkey, and Ukraine. Search engines for Brazil, England, Ireland Japan, Portugal, Russia, Scotland, Slovakia, Switzerland, and the Ukraine are in the works. “We are really excited about these search engines. We have carefully scoured the Internet looking for the best genealogical resources for each of these countries,” said Brad Pace, VP Marketing. Family history tours are continually gaining in popularity, tours to Ireland, England, Italy are common. Now, if you are one of five-million Americans whose ancestors came from Lithuania, a a press release yesterday announced a new service that will take you there. You can learn more about these tours at www.LithuaniaVisits.com. The article, "Finding My Grandmother Before I Become a Grandmother" by Vicki Boartfield is a success story, detailing how one woman realized the dream of finding her grandmother, with very little information to go on. It helps us not only appreciate the vast, ever-increasing store of information that is available today at our fingertips, but also brings home the importance of those little scraps of memorabilia that so often slip past our notice. So it may be good to take notice and keep those little bits and pieces that may not mean much today but have the potential of unlocking the past -- tomorrow. Randy Seavers (Genea-Musings blog) has been promoting a very interesting, almost viral, method for identifying and highlighting genealogy blogs and the people who operate them. Kudos Randy! As I've blogged in the past, one of my pet peeves are anonymous genealogy sites. It's great to see webmasters and blogmasters step up to the challenge and share some facts about themselves. According to the rules, when you're tagged, you're supposed to blog "Five Things You Didn't Know About Me," and then tag other bloggers. So, I've been tagged by my good friend, Lorine McGinnis Schulze (Olive Tree Genealogy blog), and am certainly up for the "challenge". It's a challenge to reflect upon oneself and reveal FIVE interesting facts about one's life. 1. I've always loved music, so when I went to college, joining the radio station, WJRH 90.5 FM, was a natural step. After two years of on air experience, and being selected to be the Production Manager, I was offered a job at WQQQ Q100 FM, and became Lloyd London for two years. I considered a career in broadcasting, as a junior I was the college station Programming Director, and as a senior, Station Director. 2. Having grown up without pets (Mom only liked cats, Dad only liked dogs), but loving animals, when I left the nest I couldn't wait to get a pet. The confines of a college dorm room limited my options, but a girlfriend at the time presented me with a hamster we names Daisy. The years of animal denial led me to seek the opposite extreme, so within a few months, my dorm room was overcrowded with a dozen little critters. I have photos somewhere. If I can dig them up, I'll post a photo of Daisy. 3. When I was a junior in high school, the first computer lab was created with TRS-80's. I was interested, but the class was offered only to the freshmen. My physics teacher had two Commodore PET's in his office, so my friend Gordon Accocella and I begged to get access to them -- during physics class, of course. The teacher made us a deal, that if we could maintain an A average in his class, we could sneak back to the PET's, and we would have to participate in every experiment lesson. 4. My wife, Elaine (pictured right), and I attended the same college and were in the same graduating class. We knew of each other by name, but never really crossed paths. During Senior Week, one of my AXP fraternity brothers told me he wanted to go on a date with this girl (Elaine), but she wouldn't go alone. So, he wanted me to come along as a date for her friend. Suffice it to say, the relationship between him and Elaine didn't flourish. Instead I spent every possible minute of that last week on campus with her, and 20 years later we're still together! 5. My genealogy websites started out as an experiment. I was working for a conservative financial company as an IT professional. In 1985, when the Internet started becoming popular, I was given the responsibility of handling my employer's web site. I loved to read trade magazines, and was learning of all these cool things you could add to your site, but felt they weren't appropriate for the company web site. So, I figured I aught to create my own web site and decided to put my family tree online at D'Addezio.com. Being of Italian descent, I wanted to include some information about Italian genealogy, but found the Internet to be too disorganized, which led me to expand the site focusing on the topic. As I tried different techniques and Internet tools/services, the site grew and eventually I launched a separate site that would be handled as a professional company called Genealogy Today. That was in 1999, and five years later I would quit my day job and focus on the site as my full time occupation. What I love about these five things is that they really contributed to the person I am today. I've learned so much from the diverse experiences of my life, and am truly enjoying my current role as an archivist, preserving our past for genealogists. I would like to tag Kenneth G. Aitken, whose blog I read regularly. Ken does a really nice job of focusing on the educational aspect of genealogy. I'd also like to tag Paul Allen (the lesser), who we all know as the founder of Ancestry.com. And since Paul is such a prolific blogger and tells so much about himself, it would be interesting to see if he is up to the challenge of sharing FIVE things that we don't already know! Randy has been keeping a list of the genealogy bloggers who've been tagged and responded. P. S. Many people have asked about the photo of myself with the dog. It was taken in a professional studio, an experience we've exposed all of our pets to. His name was Maximillian, and he past away in 2003 from a heart tumor at the young age of eight. We have another dog, and I've had a portrait done with him (his name is Moon), but he's just not as interested in what I do in the office all day. Max used to stay at my feet under the desk, and prodded me to take breaks (i.e. so he could go outside and have a break as well). I credit Max with helping prevent me from getting carpal tunnel syndrome during the years when I was doing a lot of typing while creating my sites. As reported on Clarionledger.com, Mac iFamily software remarkable, a new genealogy program for Mac users was announced. "Mac users have long envied the excellent genealogy programs for PCs and have more or less been resigned to using the far more basic offerings such as Reunion or Mac Family Tree. Now, iFamily for Tiger is a genealogy program for Mac users that is not only easy to operate but offers an innovative approach to mapping the family tree." Here are the surnames of additional railway employees added to the vintage business card collection at Genealogy Today: Bailey, Baird, Barnes, Bastable, Beck, Benson, Brome, Castater, Cleland, Cleveland, Coldwell, Colvin, Coman, Craig, Crosbie, Crosby, Duffy, Egan, Glarum, Glorioso, Gold, Gottschald, Guthrie, Haischer, Hale, Hang, Harrow, Hatfield, Haugh, Herron, Hess, Hewitt, Hoydar, Hulsey, Jahn, Kikunaga, Kirby, Knight, Liechty, Marlatt, Martin, McNeal, McNutt, Moonert, Morningstar, Murray, Newlean, Nichols, Noble, Olmsted, Page, Pengra, Perkins, Pierce, Pinger, Redding, Rosenbaum, Sage, Sears, Sheahan, Sheldon, Smith, Starin, Stevens, Storey, Sullivan, Thiehoff, Thomas, Turner, Watson, Weed, Whitney, Wilson, Woodworth. One of the cards (W. D. Cleveland) belonged to an employee of the Oahu Railway in Honolulu, which was interesting because I had never thought that there would be railroads in Hawaii. 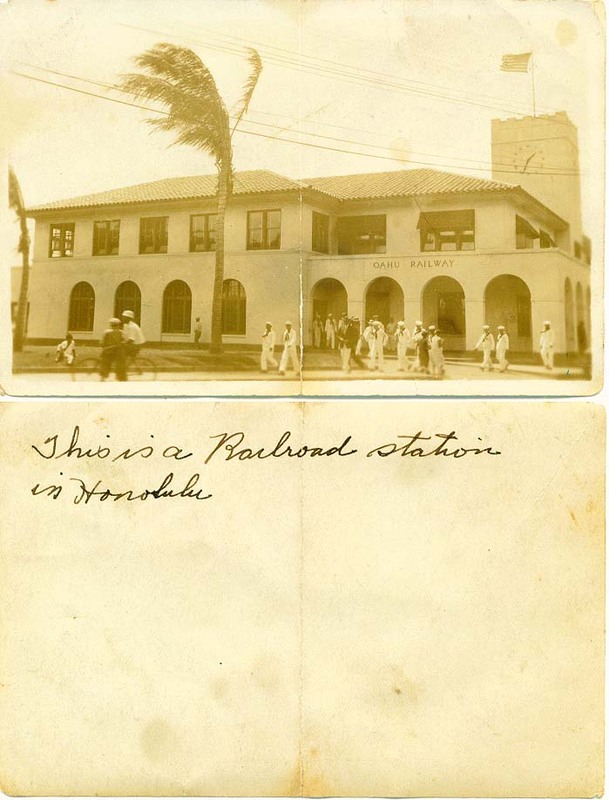 Coincidentally, I was going through a box of ephemera and came across this photo of a train station in Honolulu. You can see (click on the image for a larger version) the name Ohau Railway on the building. Maine Central R. R. Co. Stockholders - Maine Central Railroad Company Common and Preferred Stockholders as of April 1, 1924. This item was hand typed on very thin paper, which made it a challenge to get scanned. In addition, the item had been kept folded for many years. I visited my local Staples store and made a photocopy of the entire document to both shrink and flatten out the pages. The cover reads: "The complete list of shareholders and their places of residence and the number of shares belonging to each on the first day of April, 1924." I obtained this Portland, Maine document from a Florida-based book dealer who had a booth at a genealogy conference in Boston, Massachusetts. It's amazing what information is floating around out there. Now its been archived and transcribed for genealogists. In his article, DNA Surprises, Alan Smith makes the point that for all its benefit, DNA testing has its limitations and historical research is still needed to fit all the pieces together. Reviewing the well-known Thomas Jefferson DNA study, Smith explores a similar inquiry in his own family history and the inherent challenges of researching two-hundred-year-old mysteries. Pennsylvania Railroad Medals for Heroic Service - Their Purpose, Conditions of Award, and Holders. March 1926. Issued from the General Offices, Broad Street Station, Philadelphia. This is an incredible find. There are lengthy descriptions of why the medals were awarded to these 82 heroic individuals. For those of us -- which is pretty much all of us -- with long-standing brick walls, take heart. It may be a little patience is all that's needed today, as more and more important records collections come online. This week we have something to shout about. British emigration passenger lists are now online! The new web site, www.ancestorsonboard.com, details some 30 million passengers who sailed out of Britain between 1890 and 1960. As noted on the web site, these are not British emigrants only — many "European trans-migrants," people migrating from all parts of Europe passed through British ports to catch cheaper sailing to their destinations. In the past these records were available only at the National Archives in Kew, southwest London. Passenger lists provide a rich source of family history information, including the name of each passenger along with departure date, destination, and in many cases address, marital status and occupation. You can view, download, save and print passenger list transcripts and images. While you can search for free, access to the full information is available at a nominal pay-per-view rate or you can opt for a subscription. The article, Book leads way to art exhibit, appearing in the ContraCostaTime.com, provides information on "The Art of Gaman: Arts and Crafts from the Japanese American Internment Camps 1942-1946," an exhibit by author and curator, Delphine Hirasuna whose own parents were interned in one of the camps. The exhibit runs until February 25 at the Museum of Craft and Folk Art, San Francisco. Admission is free on February 19, to commemorate the signing of Executive Order 9066, which brought about the internment. You can visit the Museum's web site at http://www.mocfa.org/. An article in the Home News Tribune (NJ), THNT.com launches ancestry-search tool, announces its new data web site. Among other forms of public data, this site features the Social Security Death Index for New Jersey. What is interesting about the article itself is it's general summary of the Social Security Death Index (SSDI), what it is and how it's used. So even if you are very familiar with the SSDI as a research tool, the article may provide some new and interesting insights. 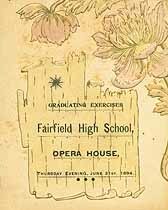 Heralding the future -- a nuts and bolts review of the Family History Archives digitization project. The beginning of a new year is a perfect time to herald the future. One the most exciting announcements to family history researchers came when the LDS Family History Library announced its plans to digitize its archive and make those records available free online. We have all, no doubt, wondered how this massive undertaking could be done and, most importantly, how long will it be? In this article, “The New Face of Family History,” Donnie Boursaw answers those questions in an first-hand look at the process. Black History Month officially begins in February, but The Oakland Museum of California is getting a good head start with a host of activities, honoring the art, strength, and faith of African Americans, in California and nationwide. The program begins January 13 and continues through February 22, 2007. The Museum web site provides a detailed listing of events.